2'' makes sense if you have an eyepiece that can cope with the field curvature of such short refractor. I did some test with FOA60 (focal length 530mm), with my eyepieces I could get about 3deg reasonably sharp FOV. I would definitely try first your 2'' eyepieces to figure out if they are really worth the hassle. If I were building OTA now, I would made it as simple as possible with light helical M44 focuser. I have had the air-spaced version of the lens for some time, but mine was intended for use as a finder mounted on a larger scope from the get-go (in addition to a sort of mini RFT on occasion), and that explains why my build here is somewhat less than glamorous. I use a 35mm ep to get 15x and, as Thomas describes, a adequate three degree field. For readers in the states, the focuser parts here are all sourced from generic hardware store parts (collet and 1 1/2" draw tube) with minor alterations and an adapter machined from 1 1/4" acrylic tubing. 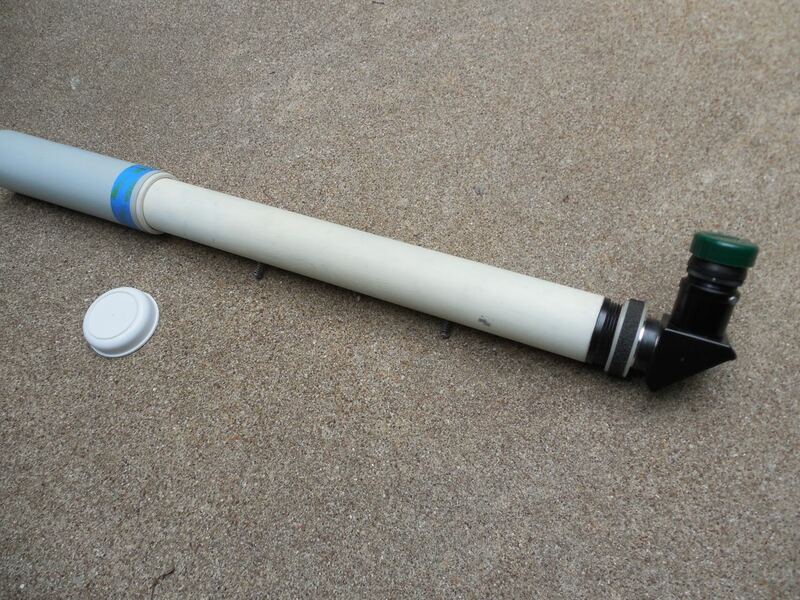 Tube is aluminum with a bored-out pvc sleeve mounting the Zeiss cell assembly. Mine fits in an adjustable cradle, and I am currently working on a modified dovetail system (monotail?) to install it on a larger refractor. I used it with my 5" f/10 achromat for several years, and the optics were sensational; there is contrast available with this kind of setup that is worlds different from what you see with a conventional finder. 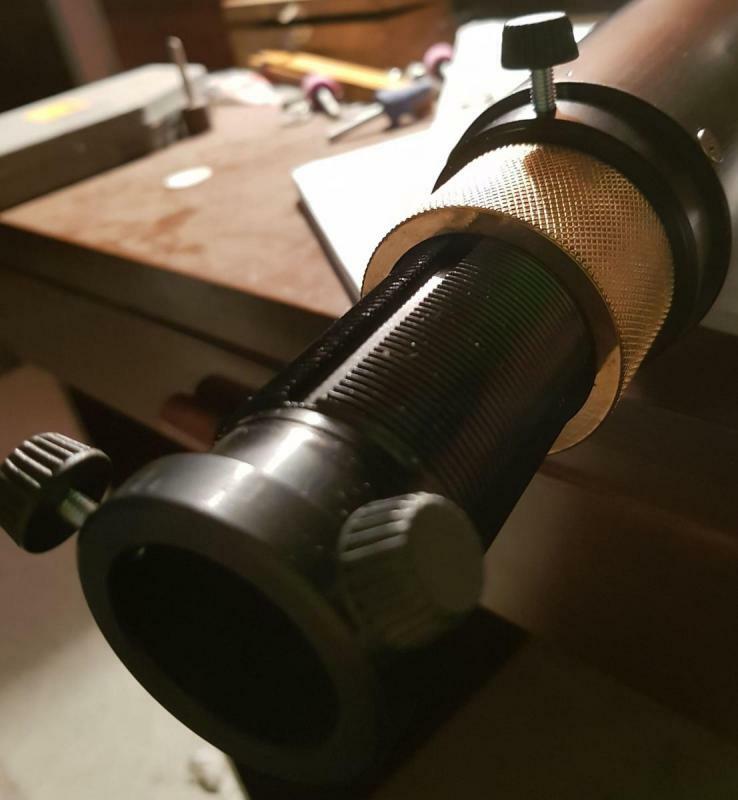 I'll admit I never tried it at a higher magnification, but it was such a good match with this particular (older) eyepiece that I never felt the need to go any further. The only down side is the over-built and therefore unnecessarily massive lens cell; the wall thickness must be close to 1/4", but it, as well as the lens, is a little work of art. Note: this scope had been in storage in plastic bag for a couple of years, and somewhere during that time the dewcap adhesive let go, which explains the blue tape temporarily holding it together while I do other things. No irony is intended! Edited by figurate, 11 September 2018 - 06:24 PM. Edited by AllanDystrup, 12 September 2018 - 06:42 AM. Allan, this one is really loaded! Sure, but it works seamlesly for both wide field and close up (using a barlow). The Zeiss revolver is perfect with a 1.7x GPC, and the balance is good with the counterweight I mounted on the front ring. The Vixen R&P focuser easily holds the revolver and works precisely and smothely when correctly adjusted. Edited by AllanDystrup, 12 September 2018 - 08:49 AM. 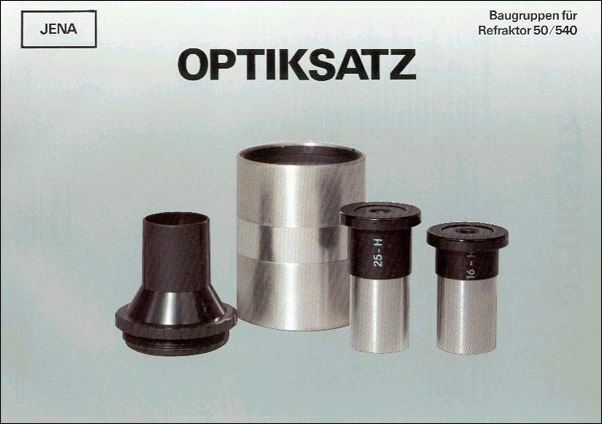 Talking about quality of the CZJ lenses, I visited the Jena factory in May1990 and was told that glass of different quality was sorted out this way: premium for Zeiss West, Swarovski and their own export products, next batch for GDR use and the rest was to be used for Eastern Europe and Third World. This was their civil production line, a closed part of the glasswork was specialised for military use. The problem of Zeiss Jena, when the Cold War had ended, was that the production involved a lot of man hours, cause basically they could not change or replace many machines and thus the production standards, since late pre-war times. But labor was cheap in Eastern Germany due to the Communist system. Everyone had a job and everything was organized. Renting apartments was also very cheap, cause the government controlled everything. For example, in East Germany a huge number of old pre-war city houses survived, whereas lots of them still were torn down in the 1960s and 1970s in West Germany. Back then, people thought pre-war architecture was just dated, impractical and old fashioned so they wanted to get something more modern. Today, we have an abundance of 1970s and 1980s architecture in West Germany that everyone hates. And the few pre-war city houses that survived, have been rebuilt to modern standards and are hyper expensive. The whole financial system collapsed in the late 1980s and made Gorbachev, who knew this earlier and more clearly than the leaders in East Germany, start Perestroika and ultimately lead to the reunification of Germany. East Germany thankfully folded down before all their pre-war city houses, many of them in a horrible state because of the hyper low rental fees which did not allow the owners to carry out any work on them, were so beaten that they would literally collapse under their own weight. Literally over night, people regarded the cities and houses as being beautiful and started rebuilding everything. That's why some Eastern German cities today just look jaw-dropping beautiful and classic. Overall, though, the reunification was more a take-over from the West Germans. A lot of money went there, to rebuild East Germany. In the end, many folks in Eastern Germans thought that the people from the West would just buy out "their" country and not value what they had been working on through all those years. Even today many people still feel a rather big difference between West and East Germany, and there is a lot of bitterness involved in the memory of those who experienced first-hand what happened with all those facturies and companies in the early 1990s, after the reunification. 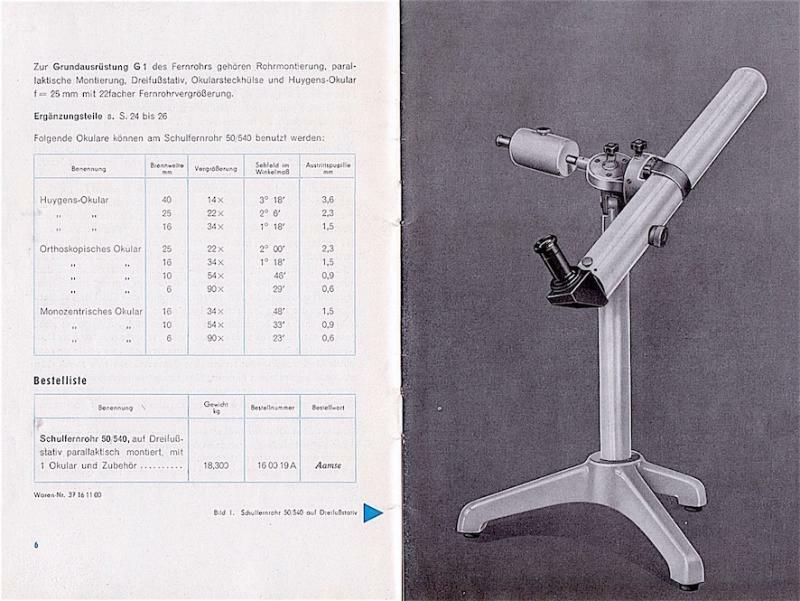 Zeiss was in a good position cause the company and the name also existed in the west, so it was not like Wartburg or Trabant cars that just ceased to exist. Still many of those involved, felt it was sad that the traditional manufacturing of amateur telescopes would not be carried on after 1995 or 1996 when the last ones were assembled. I was attending this years star party in Kompedal, Jutland, where one of the regular vendors offered me a brand new C 50/540 Zeiss objective for just $62. I wouldn't say I had wanted one BADLY for a long time, because if I had, I'd bought one many years ago, but now that I have one, I obviously am going to build a scope around it. It has the potential to become a very nice traveling scope. I'm sorry for the very poor image quality; the one in my cellphone isn't very good at all, but it was what I had on hand. Naturally, I'm now thinking a lot about what kind of tube I should build around it. I might of course just slap a crude one together from various parts from my boxes with miscellaneous junk bits and pieces, so I can actually use it, while trying to build something better. Ultimately, I'd really like something that looks like a mini version of a Zeiss AS100/1000 or one of the APQs or something. That'd be both fun and cool, I think. Maybe something very compact, where everything, including the mount and tripod, fits into a single, not too large box. I already have a small, surprisingly stable, black wooden tripod, which might be suitable. I just need a tube and a mount. Congratulations on the find. I've owed a couple of different samples and both were excellent. Below is the last OTA I built. Also pictured is the kit these were sold in. I have two 50mm f10 ish lenses. One has no cell. Coatings look brownish if I remember correctly FL is closer to 540mm. I'll check when i get home. The other is mounted, air spaced with about a 1.5-2mm air space. It was part of some optical bench equipment. Quick DPAC showed it to be close to perfect as I could see. I'm not really into small scopes, but I do like my Asahi Jupiter 50mm 600. Crisp little thing. I looked at these last night and the cemented one is 52mm and 380mm Fl, has straw colored coatings but FL is wrong for a Zeiss lens. Used this one for a sun projector during the eclipse. Has a small gouge in the center that was there when I puled it out( wrapped) of the box. The air spaced one is 500mm Fl. Got a tube for the objective thrown together today and had first light this evening. The tube is an aluminum tube from a scrapped 60/700mm Chinese achromat. I just wrapped the 50/540 cell with cardboard and a little tape and push-fitted it into the tube. Works like a charm and the back focus is adjustable! The objective sits deep into the tube, a full 150mm (6") from the front. Dew is hardly going to be a problem. Collimation is spot on. The focuser is a plain aluminum R&P with Vixen M36.4 threads. I use my Vixen M36.4 diagonal on it and 0.965" or 1.25" adapters. 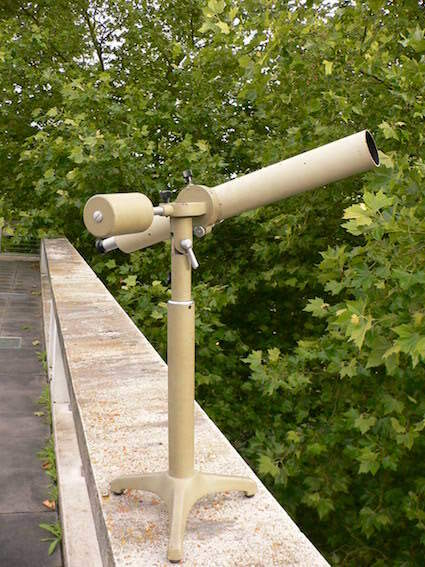 The scope is mounted on an EQ-3-2 mount on a lightweight aluminum tripod. Notice how little counterweight is needed. 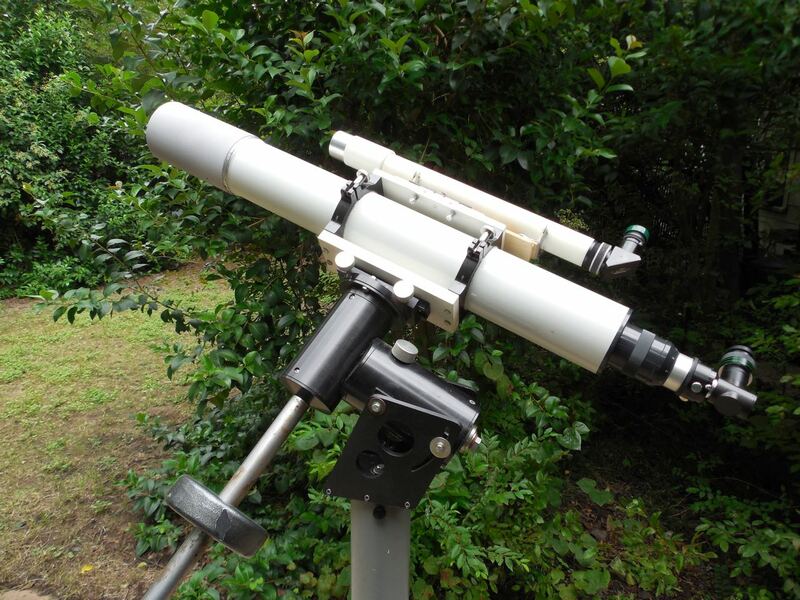 The scope, as shown, with diagonal and O-16 eyepiece weighs just 1180 grams! It is incredibly lightweight and the mount just laughs at it. The mount even has a motor drive, an unimaginable luxury for the customers the 50/540 objective was originally designed for! I wasn't using the drive during my testing, though, as the batteries had run out and I didn't have time to replace them. First light was the Moon in early twilight. 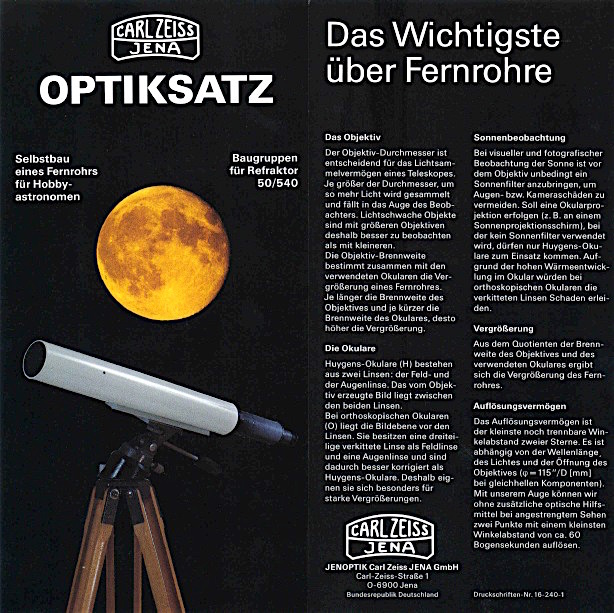 I was using a 25mm Zeiss huygenian eyepiece to properly mimick what someone starting out with one of these from a Zeiss "Bastelsatz" would have seen during first light. To my shock and horror, the Moon wasn't sharp in the 25mm or the 16mm huygenian. There were clear signs of pronounced astigmatism! After suffering a mild panick attack, I calmed down and took the scope back inside and pushed the lens cell out again with a broomstick. I inspected the cell and found that the retaining ring was quite firmly tightened. I loosened it with a screwdriver enough to give a faint rattle and pushed it back into the scope again. Now the Moon had slipped behind a tree, so I aimed at Altair instead. I couldn't see a thing. Puzzled, I aimed at the Moon again, because despite it being mostly behind the tree, I could at least be sure I was aimed at it. It was badly out of focus and I realized that in my hurry, I hadn't pushed the objective as far in as the first time. After adjusting the back focus, the scope now snapped in focus. Relief! 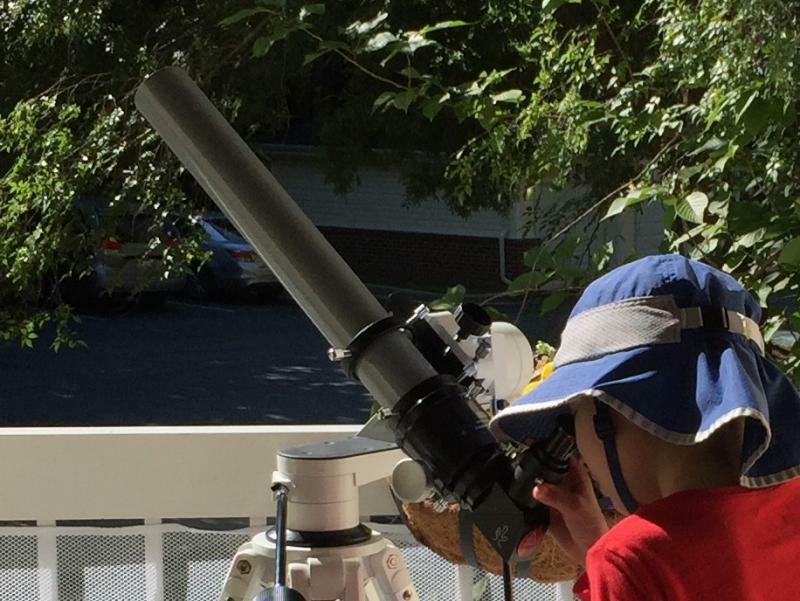 Aiming at Arcturus, I conducted a quick star test. Everything looked fine now! The star test was very good, with a sharp airy disk at 90x (6mm Zeiss ortho) and basically identical patterns on each side of focus. Saturn was faint in the bright twilight and quite fuzzy from haze. Still, the ring was easily seen at all powers. I have no doubt more details can be seen under better conditions. 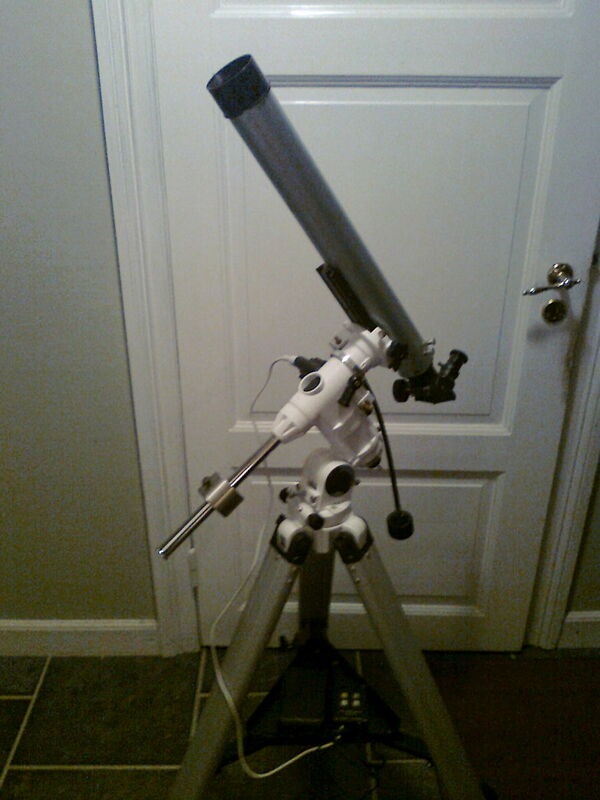 I picked up the scope and moved it a few meters so that I could observe the Moon. The seeing was very soft so low in the sky, but it was clear that the lens showed a very clear image with almost no false color. I removed the eyepiece and looked for signs of stray light. I was a bit startled to see none whatsoever. Upon closer inspection, it appeared that the baffle in the tube actually stopped the objective down a little. I would need to measure it when getting back inside, but for now I decided not to worry about it. Slowly, darkness fell, though it was still twilight I changed to 1.25" eyepieces and started to observe deep-sky. In a sky so bright, I could *just* make out mag 3.9 Eta Cygni with the naked eye, the scope had no trouble showing M57 as a tiny, fuzzy glow at 22.5x with a 24mm ES68. A 14mm ES82 (39x) showed it effortlessly. In an 11mm ES82 (49x) I could begin to glimpse the darker center. M13 was also shown without any problem whatsoever at 22.5x. Soon, the Milky Way began to slowly glow, high overhead. In a darker sky, the views the 24mm ES68 offered were nothing short of stunning. The stars are absolutely pinpoint across the entire field, from edge to edge. I checked carefully, and stars are just as pinpoint at the field stop, as they are in the middle, although I'm sure that the accomodation of my eyes have some part to play in this. A bit worryingly, I began to detect astigmatism at high magnification again. Not much at best focus, but clearly there. I wonder if the cell is *just* barely large enough and pinches the optics slightly when it cools down? It could also be that the cemented lens has developed some stress, when the cement has aged. This is not unheard of. We'll see in the coming weeks, when I can hopefully observe with the scope under different conditions. A layer of clouds were now moving in from the west and had already covered most of the western sky up to the zenith. I changed to objects in the eastern sky. M31 and both companions showed up rather nicely, though the companions were faint, which is understandable, given the conditions. The Double Cluster was stunningly sharp at 22.5x and should be a glorious sight on a really dark night. NGC 7789 was faintly visible as a large, dim glow at 22.5x. Gamma Andromedae was clearly resolved at 39x. Overall, what I'd consider a very good first light. Back inside, I measured the aperture with the laser method and was mildly shocked to find that the baffle stopped the lens down to 45mm! Once more, I pushed the cell out with the broom handle and then used the handle to push the baffle further back in the tube, towards the focuser. After a bit of trial and error, I found a good position, where it didn't stop the objective down and there was only mild vignetting along the edge of the field of a 1.25" eyepiece and yet only a very small portion of the inside of the tube could be seen from the focuser end. Now I'm eagerly awaiting second light! A 2" focuser probably isn't needed. A magnification lower than ~20x is basically as well or better covered with normal 50mm binoculars. 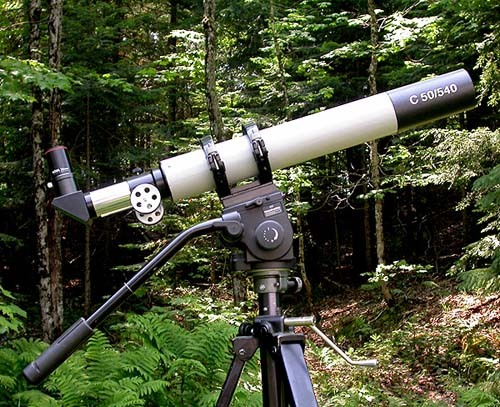 The strength of the 50/540 is that it can use higher magnifications than the binocular and here you don't need 2" eyepieces. The views in the 24mm ES68 were quite amazing and felt very wide, actually. A small RACI finderscope is DEFINITELY needed!! The scope is almost TOO lightweight! Even something as modest as the 24mm ES68 throws it out of balance in both DEC and RA. A little more mass, properly invested in a more solid tube, focuser and finderscope, wouldn't hurt. Got a quick look at the Sun today, just a few moments ago. 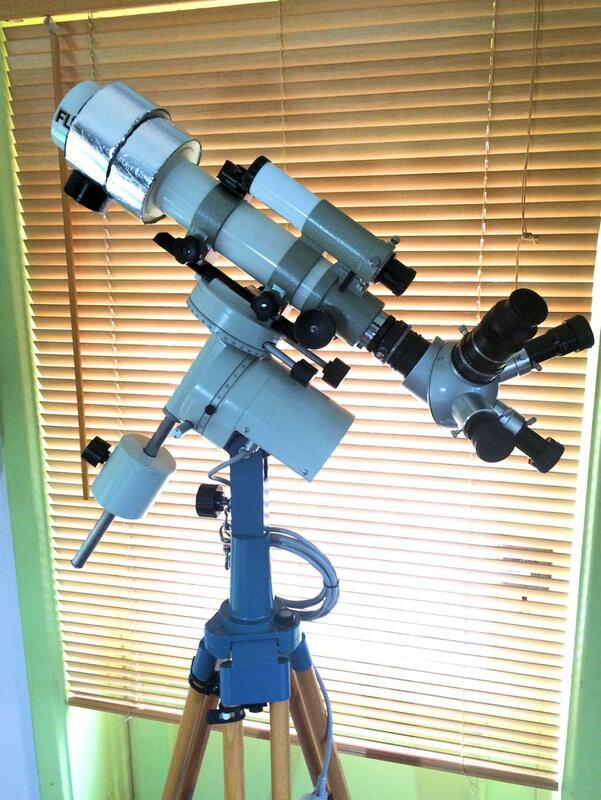 This scope is nearly perfect as a quick-look solar scope, both with a Herschel wedge and for H-alpha. There wasn't much activity in H-alpha, apart from a couple of small, but quite nice prominences, and the disk was totally blank in white light. I'm using a Quark for H-alpha and since it's quite heavy, I need a better, more solid focuser. Especially since I like to use a binoviewer on it! An internal focuser like on the Telemator would be the best, I think. The views in the Quark were very, very nice and showed great promise. Most of the disk is visible even without a telecompressor and the contrast is high. Now it irks me that I passed up on a complete 40mm Coronado front mounted etalon setup at the star party where I bought the 50/540 objective. It would have allowed much faster setup time than the Quark and been perfect for those five-minute winter solar observing sessions. Oh well. Coronado h-Alpha filters are great and very versatile, I’ve got a couple, but don’t forget, if you get the front-mounted etalon, you have to have the rear blocking filter and it needs to be a Coronado, a Lunt BF won’t work with a Coronado etalon. It was a complete set, including the tilt-tuner and diagonal. These are beautiful little lenses. I got two, an E type and a C type. Both are great. I use the E50/540 (air spaced) as an educational telescope and solar scope with a Hershel wedge (Lunt, 1.25 version) and a solar continuum filter. The images are great. Edited by Mak2007, 22 September 2018 - 10:08 AM. Edited by Mak2007, 22 September 2018 - 10:09 AM. Edited by Mak2007, 22 September 2018 - 10:10 AM. Edited by Mak2007, 22 September 2018 - 10:13 AM. Edited by Mak2007, 22 September 2018 - 10:19 AM. I bought one NOS C50/540 some years ago from Markus Ludes in Germany. 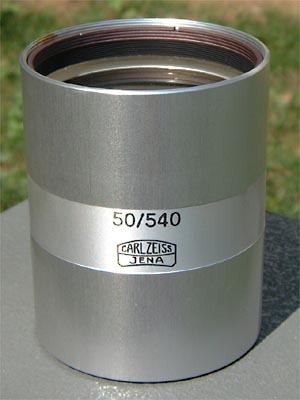 Very nice objective lens. No complains about image quality or its figure in Ronchi test. By the way, There is another version of 50/540, an air spaced "E" type, hard to find.